An enlarged heart is just what the name suggests?a larger-than-normal heart. Enlarged heart is not a condition, but is rather a symptom of another condition. The heart can become enlarged from a disease that makes it pump harder than normal, such as high blood pressure or heart valve disease. The heart is a muscle, and like any other muscle in the body, extra work makes it grow bigger. But while big muscles in the shoulders or thighs can be beneficial, an overly muscular heart is dangerous. Having an enlarged heart makes you more likely to develop blood clots. These clots can block the flow of oxygen-rich blood to the heart, causing a heart attack. If a clot travels to the brain or lungs, it can similarly cut off blood to these crucial regions, causing a stroke or pulmonary embolism. When the heart has been overworked for a long time, it will weaken to the point where it can?t pump out enough blood to meet the body?s needs. This condition is called heart failure, and it?s very serious. Sometimes an enlarged heart can interrupt your normal heart rhythm to the point where it triggers cardiac arrest?when the heart suddenly stops working normally. Treatment for an enlarged heart depends on the cause. Medicines such as beta-blockers, angiotensin receptor blockers (ARBs), angiotensin-converting enzyme (ACE) inhibitors, and diuretics lower blood pressure to reduce the workload on the heart. Anticoagulants prevent blood clots to lower the risk of a heart attack or stroke. And anti-arrhythmics keep the heart beating at a constant rhythm. Some people may need surgery to fix a valve or bypass a damaged artery, or to get an implanted cardioverter-defibrillator (ICD) to keep the heart in rhythm. If heart failure progresses to the point where other treatments don?t help, a heart transplant may be necessary. 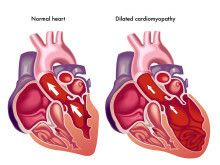 Cardiomyopathy: What Causes an Enlarged Heart?